Is this is a bug? Where to post Nemo bugs. Does someone know a workaround? EDIT: I have created a bug report here. Cinnamon is causing problems when running Nemo desktop under Unity. You have to completely remove both packages, add the Nemo only PPA from NoobsLab, the Backports and Cinnamon repositories install Cinnamon packages along with Nemo, finally reinstall and configure Nemo. Make sure all packages are removed by using Synaptic Package Manager (there is probably a way to use regex with the apt-get remove command but I am not comfortable enough to try that) Note: I did this because some packages were not automatically removed using apt-get, I searched for both Cinnamon and Nemo to manually select any packages installed for either package then used the completely remove option. Voilà! Nemo is happily taking care of your desktop again! After that I followed Andy Braham's instructions to used the NoobsLabs PPA for Nemo. I had what I think was a closely related problem. I am running Gnome Shell in Quantal 12.10 and loaded Nemo to replace Nautilus. Unfortunately, I don't recall how I installed it. 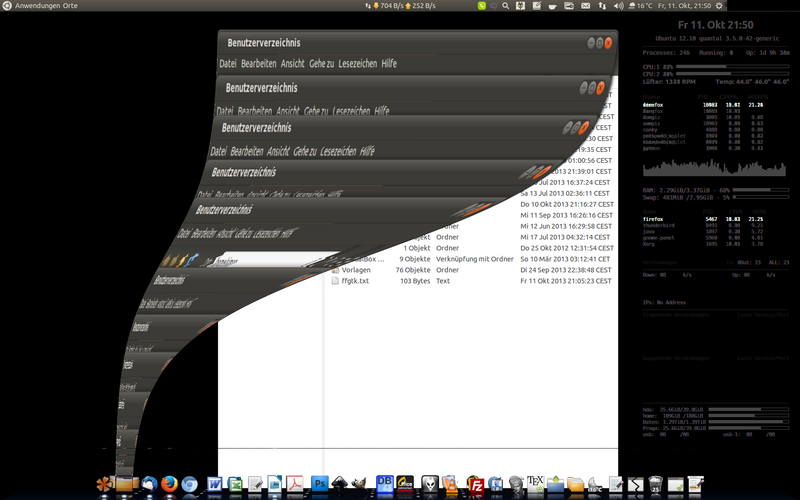 After a while, my desktop failed to render properly. It looked strange; as-if the theme had been lost. The Look-and-Feel of Gnome Shell was gone. The colors made editing filenames on icons impossible. There were a number of other major annoyances. I followed Andy Braham's advice (from the accepted answer) to remove the software. But then I followed the Noob Labs's blog posting http://www.noobslab.com/2013/10/nemo-file-manager-with-extensions-for.html to reinstall Nemo. After a reboot, the problem was resolved. I hope it stays resolved. But I'm not sure, since I saw the problem come and go (mostly come and stay) prior to the fix. I had the same problem, but got it working now with nemo 2.2.1.
follow all steps as mentioned by Andy Braham including the update, except I used http://ppa.launchpad.net/webupd8team/nemo/ubuntu instead of noobslab. I don't have the glitch anymore. I will try install cinnamon again (stable version this time) and if the problem comes back I'll post it here. But since you aren't using cinnamon, the above should work. Worked for me in Ubuntu 14.04 anyway. Not the answer you're looking for? Browse other questions tagged nemo or ask your own question. How to get rid of toolbar text?